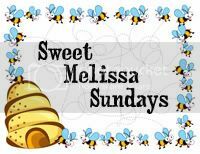 This week's Sweet Melissa Sundays (SMS) recipe was chosen by Jen of Not Microwave Safe: Sticky Buns with Toasted Almonds. I love cinnamon rolls and sticky buns and almost chose this recipe when it was my turn to pick, but in the end I chose the Bee Stings instead. So I was delighted to see that someone finally picked this recipe! Working with yeast really isn't that bad. I remember when I used to be so intimidated by it. This recipe is a bit time consuming, but is not difficult at all. It is split into two days with an overnight refrigeration so you don't feel like you are baking all day. One thing I always do when baking with yeast is I use my oven as a proofing box. I'll preheat the oven for about a minute, just long enough for it to warm up but not to where it starts to get hot. Then I turn the oven off and stick my dough in and let it rise. This ensures that it is always warm enough for my dough to rise regardless of what time of year it is. I omitted the orange zest from this recipe, just because I didn't have any on hand and didn't want to make a grocery store run just for orange zest... I am sure that the zest would probably add a great subtle flavor to the dough but it also tasted just fine without it. I also omitted the toasted almonds because I don't like nuts, but you can also cover these with cream cheese frosting if you don't want to top them with sticky sauce. These smelled so good while they were baking in the oven... in fact, that was how I knew to check on them early. The smell of sugar and cinnamon was so strong that I though I'd better check on them - and it was a good thing I did because they were done in HALF the time indicated on the recipe! If I had waited for my timer to go off, these would have been burnt to a crisp! Thanks Jen, for choosing this recipe. I will definitely be making this one again. If you would like the recipe, you can find it here. Make sure you visit the SMS Blogroll to see how everyone else enjoyed this sweet, sticky treat! - I added room temperature milk instead of cold milk to make sure that my dough would rise. - I had to add a little over 1/2 cup of extra flour to get my dough to be not so sticky. So I used the full 2-3/4 cup, and then continued adding 1 tbsp of flour at a time until the dough no longer stuck to the edges of the mixing bowl. - I did not have pure maple syrup so I used pancake syrup instead (Aunt Jemima's). - I used salted butter in my sticky sauce and could taste a little bit of the salt in it - this was great because salty and sweet flavors go together very well. - Use your oven as a proofing box. Preheat the oven for about a minute, just long enough for it to warm up but not to where it starts to get hot. Then turn the oven off and stick your dough in and let it rise. This ensures that it is always warm enough for your dough to rise regardless of what time of year it is.- Start checking on your buns around 20 minutes. They will probably be golden brown and done around 25 to 30 minutes, depending on your oven. - You can easily freeze these. Prepare the recipe as directed up until the overnight refrigeration step. Then, instead of refrigerating it, wrap it tight and freeze it. When you are ready to bake, remove it from the freezer for the second rise until the dough has doubled in size and then bake. They look so tasty even without the nuts (I love nuts)! I have found the baking times to be off with a lot of the recipes in this book. I pulled mine out after a little over twenty minutes. At least they didn't get burnt to a crisp! and great idea to use the oven as a proofing box--I had never thought of that! Your rolls look ooey-gooey delicious! The only thing missing here is a steaming cup of coffee. I'd love a couple of these babies, they do look delicious!!! They look so good and perfect! This look achingly good jaime. Great pics Jaime - they look delicious! I thought the orange zest was really good in this recipe so if you try it again and happen to have an orange on hand, I'd throw in the zest! I can't wait to try this recipe with the cream cheese frosting either. They look fantastic! I was thinking the sauce might be better with salted butter, so it's good to know it worked well. 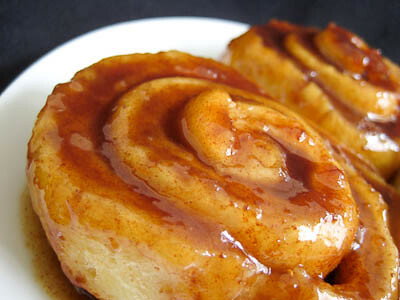 hose buns look so moist and sticky and good! They look soooo good, Jaime!! I'll take one! This weekend I made my first yeasted dessert, butterhorns. Unfortunately they weren't as good as I hoped. I either cooked them a tad to long or added to much flour. 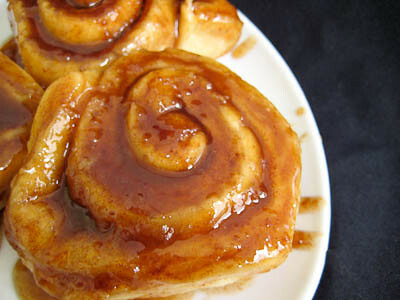 Oh, well, I'm not going to be deterred as I want homemade cinnamon rolls and sticky buns! um, this blog is going to take over my bookmarks! I have been saving so many recipes!! These look fantastic! 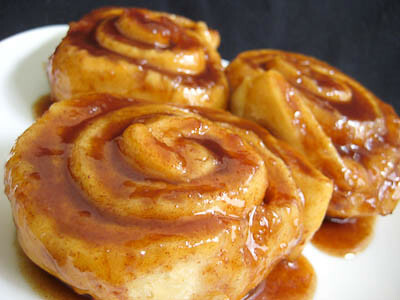 Your sticky buns look great. To me, the nuts didn't do anything for the recipe (and I love nuts!). 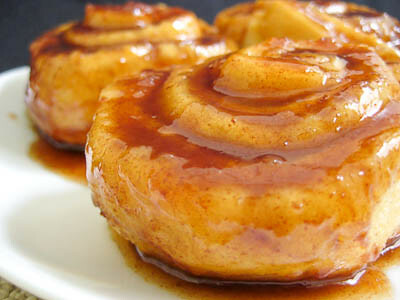 I really want to make sticky buns sometime soon. I've been meaning to make them for a long time and never get around to doing it! ooey gooey and oh so good! These buns look picture perfect. Beautiful job! They are amazing with cream cheese frosting, although I didn't use the recipe from the book. I'll be interested to see how they measure up to Cinnabon! Those are some BEAUTIFUL buns, Jaime! Fantastic job... your photos make me want to get back in the kitchen to bake another batch! I just came accross your blog :) Love it! I have owned this cook book for at least a couple of years. So far I have only made the carrot cake, my favorite! I have booked marked this recipe, I think its time to test it out!